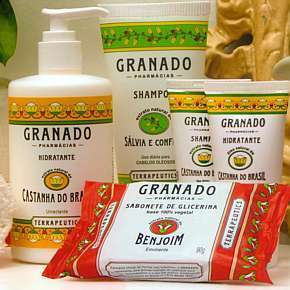 Granado products, photo by www.estadao.com.br. RIO DE JANEIRO – It may seem an unlikely success story, but antiseptic talcum powder launched 138 years ago deserves its place among such iconic Brazilian products such as rubber sandals and dental floss bikinis. The brand is Granado, and it is a household name in Brazil famed for its traditional, brightly-packaged cosmetics. Gramado Pharmácias were established in 1870 in Rio by José Antônio Coxito Granado, who was Portuguese. He was only fourteen years old when he arrived in Rio in 1860 and began working in a pharmacy in what is now Buenos Aires Street, in the Centro district. Ten years later he knew enough about the business to open his own, in what is now Primeiro de Março Street in Centro, number fourteen. The location proved to be incredibly lucrative for Granado Pharmácias, in the bustling heart of imperial Rio de Janeiro, amidst government buildings, shops, restaurants and tea-houses. José soon roped in his brother João to help grow the business, and the pharmacy expanded into the neighboring shops on both sides of the original storefront. The capital’s population were used to products imported from Europe, and were delighted by the quality and ‘toilette’ style of Granado. In 1880, the pharmacy assumed the title of ‘Imperial Drogaria e Pharmácia de Granado e Companhia’ (Imperial Drugstore and Pharmacy of Granado and Company) and began printing the imperial coat of arms on the labels. José Granado became a personal friend of Emperor Pedro the Second and the pharmacy soon evolved into a meeting point for diplomats, writers, bankers and socialites. Among the regular clients were judge Rui Barbosa and political activist José do Patrocino. In the beginning of the Twentieth Century, Granado began to open other pharmacies in Rio, including one in what is modern-day Tijuca. The company then opened franchises in Salvador da Bahía, Belo Horizonte, Porto Alegre and São Paulo and also sent representatives to Chile, Argentina, Venezuela and Africa. Granado antiseptic talcum powder, photo by www.drogariaminas.com.br. The famous talcum powder was invented in 1903. The original packaging has been maintained until the present day, and is available in pharmacies and supermarkets all over Brazil. The design is composed of golden art nouveau embellishments and typeface and is present in many of Granado’s other products, including modern additions such as the recently-lauched fuschia ‘Pink’ line including pumice foot scrub and cuticle cream. José Granado died in 1935 and his brother João took over the business. The company remained in the family’s hands until 1993, when it was bought by Englishman Christopher Freeman. In the 90s Granado became the pioneer in producing glycerine soaps harnessing the properties of Brazilian herbs, flowers and fruits and anticipating the recent trend for organic products. The result was an increase in turnover from R$10 Million in 1994 to R$100 Million in 2004. 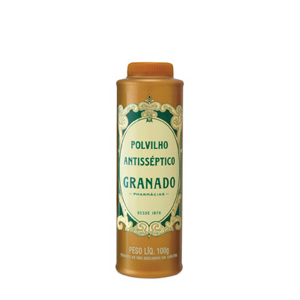 Granado’s line today stands at over three hundred products, including traditional items such as talcum powders, soaps and syrups and more modern additions such as products for women, babies and even pet grooming. The packaging is instantly recognizable for its use of bright colors, retro typeface and Brazilian ingredients such as açaí (an Amazon berry) and castanha do Brasil (Brazil nut). In 2004, Freeman took over the soap brand Phebo, and with this divided his products into those related to health under Granado and cosmetics under Phebo. With an investment of R$35 Billion, the line diversified to include toothpaste, make-up and perfume. Freeman now has plans to take over other brands and to open shops worldwide. It’s not “Castanha do Brazil,” but “Castanha do Pará.” Pará is a state in nothern Brazil. Sorry Emillia, the soap scent in question is “Castanha do Brasil” which is the actual name of the Granado Pharmacias product, regardless of it’s accuracy. Don’t wanna be picky, but Emilia is accurate: The text didn’t say the name of the product, but actually “ingredients such as…” and the name of the ingredient is “castanha do Pará” in Portuguese, but called Brazil nut in English — just one of those normal confusions. R$35 Billion! Seems like a ridiculous sum for toothpaste & make-up. Are you sure it is not R$35 Million?